As we all know, data performs a significant role on improving teaching and student learning nowadays. However, data looks scary some of the time. There are always tons of data, and it takes brave of us to dive into it for figuring out what it can provide us on a higher level based on evidence on guiding our future work, so that it plays its role as what we think it is supposed to do! How can we as a school uses data wisely? 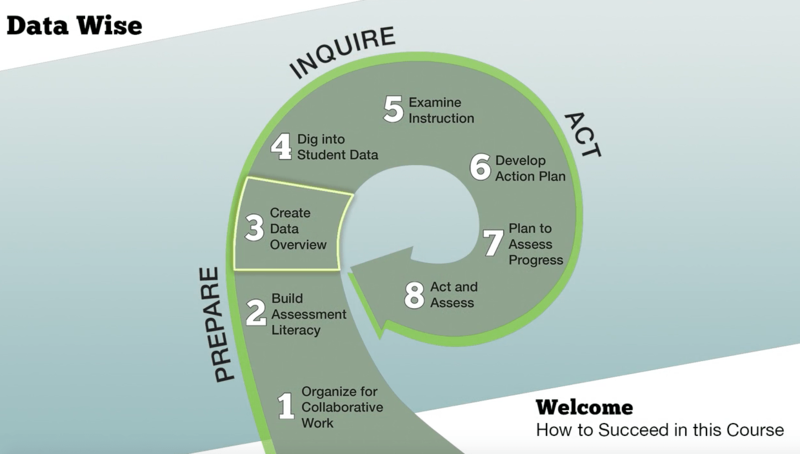 Actually, we are now in a collaborative process for using data in Data Wise: A Step-by-Step Guide to Using Assessment Results to Improve Teaching and Learning, to pursue effective actions taken for improvement. In order to make sure collaborative work being carried on positively and effectively, at the very beginning, we’d better set our norms, and besides, monitor our thinking process to maintain a relentless focus on evidence. In Data Wise introduced by Harvard University, assuming positive intentions, taking an inquiry stance and grounding statements in evidence can be good norms for team members for working together. And, something we’ve learned in our work is that human beings have a tendency to see patterns, make inferences and judgments, and draw conclusions quite quickly from just a small amount of data. This is an important skill but at the same time it can be dangerous for leading us to misinformed judgments when we are too quick to draw inferences from a small quantity of data. 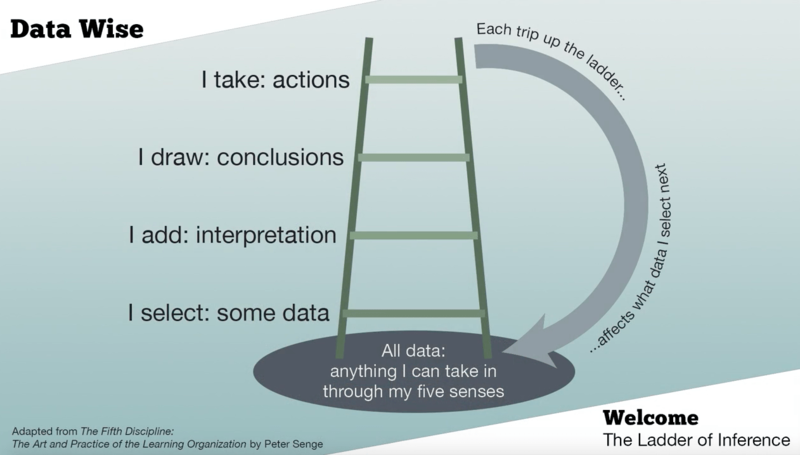 A mental model called “the Ladder of Inference” is especially useful in helping educators resist this tendency and stay focused on the evidence. The pattern is whenever I perceive something, I first select some data, then, I add some interpretation, draw conclusions, and finally take actions. The actions I take then influence what kind of data I collect next. Considering the loop, it can be very dangerous to go up the ladder too quickly. So it’s better for all of us to use this model to help each other maintain a relentless focus on evidence. Holding the norms and the mental model when working and learning together, at ISB, we have organized for collaborative work, and we are working on building assessment literacy through several ways, for example, relevant books provided at OOL, staff training opportunity, outside specialist visiting, etc.. For a quick and better understanding of data, we have worked on to visualize our data as better as we can. We’ve prepared graphs and charts instead of large amount of data displayed in our meetings. Teachers are advised to answer questions like “what do I see, what do I notice, what do I wonder” to better understand, interpret data based on the evidence. With the foundation laid, collaborative work organized and assessment literacy built, we are able to move on in our data driven process. Instructional team leaders choose a focus area for the coming semester or school year, some time, it has been declared from the top. The focus area tells team leaders which data sources on the data inventory should be paid attention first. They create a high level data overview that shows how students are doing in this focus area, for example, data from an annual performance assessment can be used here. In their meetings, they work together to see patterns, do analyzation and find the story behind the data. In their next meeting with the broad group of faculty, they’ve prepared the data being displayed by charts or graphs, so that it allows everyone to make sense to the data quickly. More importantly, opportunity is provided to teachers to find their own meaning about the data. However, this overview data will never tell how to improve learning and teaching, it brings curiosity among teachers about why the data looks like this, and teachers can then identify a priority question as the focus. Although the overview data teachers looked at in the previous step may have given some hints about where students are struggling, it’s unlikely that it offered enough specific information to explain the reason for that struggle. So, another step, to dig into the student data, is important, because it makes sure that before jumping to conclusions about how to solve a problem, teacher and the whole team have a clear sense of exactly what that problem entails. Teachers examine a wide range of student data, then, come to a shared understanding of what student data show. At last, they identify a learner-centered problem, and are ready to examine instruction. During this process, teachers examine a wide range of instructional data. They are all clear about the purpose of their observations in classrooms, which is not judging anyone, but finding out what happened! Then, they work together to gain a shared understanding. Through this whole process, teachers need to separate person from the practice, be reminded with the collaborative working norms themselves, and focus on practices itself not who is doing it, always stick to the fact, so that to identify a problem of practice. A problem of practice is directly related to the learner-centered problem based on evidence found when examining instruction, within teachers’ control. This problem of practice is a statement about practice, not a question. It is specific and small, so that it allows teachers to develop an action plan for addressing the problem of practice. There are some places to look for instructional strategies, such as rubrics for effective teaching, curriculum materials, external websites, and the expertise of instructional coaches who work in the school system. Before jumping into action in the classroom, another step is needed. We’d better make a plan to assess progress. This is where we specify the evidence of student learning that we hope to see once the instructional strategy is in place. Our plan to assess progress will provide the information we need when we move on to the last step – Act and Assess. It’ll help us measure the extent to which our instructional strategy is working, or not working. We can choose assessments to measure progress and set student learning goals. At last, we act and assess. We implement the action plan and the plan to assess progress. We also adjust the action plan, and what’s important, we celebrate the success! However, once we reach the last step, there’s still more to do. Noticing the shape of the Data Wise arrow, it points right back to step three “create data overview”. Each time we begin a new cycle of inquiry, teachers as a team bring the experience we gained from our previous efforts and use that to take on new and more challenging problems of practice with greater skill and insight. Isn’t this something cool? When we work as a team, instead of looking scary, data does guide us on improving teaching and student learning when under design, carried out step by step!